Henry Roeland “Roy” Byrd, better known as Professor Longhair, was an influential musical talent in early New Orleans rhythm and blues. 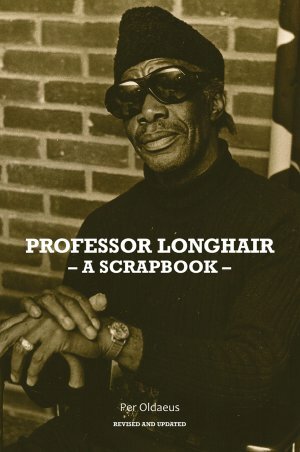 This collection of photographs and memories documents Professor Longhair’s entanglement in New Orleans music and popular American music in general. Along with vintage photos are short essays chronicling his impact on performers and music professionals including Robert Parker, Charles Connor, “Hungry” Williams, Jerry Wexler, Malcolm Rebennack, Wardell Quezergue, Art Neville, and Alvin Batiste. Excerpts from articles published around the world round out this fascinating glimpse into the mystique surrounding this notable musician. In his creative adventures, freelance musician and researcher Per Oldaeus attended various art schools across Europe. He discovered New Orleans rhythm and blues and jazz music when he was only 14 years old. Four years later, he caught his first live New Orleans-style jazz performance at a concert in Stockholm. At the age of 20, he made the first of his many pilgrimages to the Crescent City. Oldaeus has written extensively for jazz and blues magazines. He lives in Stockholm, Sweden. A native of Great Britain and resident of New York, John Broven has been an ardent fan and record collector of Louisiana music for decades. In recognition of his research into the history of music, Broven was named an honorary member of the Louisiana Music Commission and was elected into the Louisiana Hall of Fame. He has been co-editor of the British magazines Blues Unlimited and Juke Blues and was a consultant for London’s Ace record label where he supervised many CD reissues of Cajun, zydeco, swamp blues, and swamp-pop music.